I didn’t grow up eating mangoes. They may be one of the most popular fruits in the world, but the produce available at the military commissaries where my mom usually shopped didn’t get much more exotic than oranges and bananas. Not until I began eating my way through the myriad Indian restaurants in Silicon Valley did I discover the joys of this luscious tropical fruit. Mango lassi, a cool concoction of pureed mango and yogurt, quickly became my favorite beverage to accompany searing hot curries and spicy samosas. Then I began encountering it everywhere – in salsas, baked goods and a friend’s signature black bean salad. Still, I didn’t cook with mangoes that often. I didn’t know how to choose well and the prospect of cutting one up was daunting. By the time I had cut out the massive central pit, I had a big mess on my hands and not much usable flesh to show for all the effort. 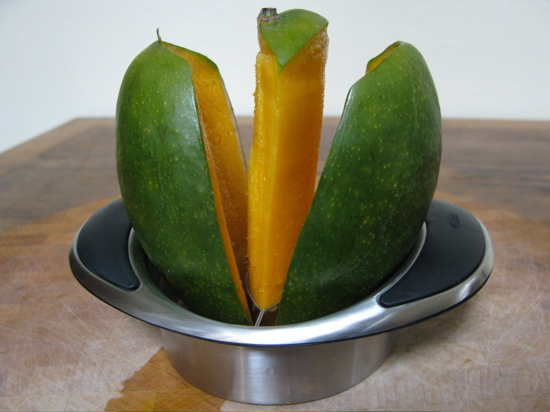 That changed when an editor urged me to test drive the mango splitter from OXO. It was a revelation. 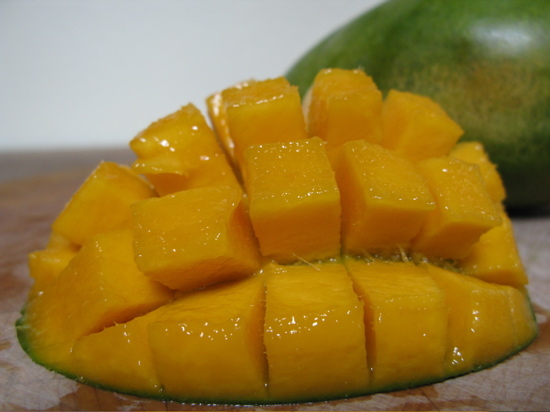 With one stroke, the mango was split vertically into two halves with the pit standing free. There was very little waste and I began thinking of the mango as an ingredient I might cook with rather than something to order only at a restaurant. Although the season for most imported mangoes is in spring and summer, California’s mango crop is now at its peak. The folks at Purity.Organic sent me a couple of their big, juicy Keitt mangoes from the Coachella Valley to taste and I was so impressed I went out to buy more at Whole Foods despite their high price – $3.99 each for fruit weighing 1½-2 pounds. The flesh of these mangoes is sweet and succulent with the silky texture of velvet and a bright, tropical flavor hinting of pineapple. Not only are they organic, they also have spent more time ripening on the trees, and have not been treated with radiation or heat like most imported mangoes. Their short season runs September-October. Unlike most mangoes, the Keitts are still green when ripe. Their skin may yellow a bit but they don’t get the characteristic blush of many mangoes that are ready to eat. They do begin to feel a little soft when handled and there’s a whisper of fruit when you sniff the stem end. When you slice them open, the dripping flesh ranges from dark yellow to a brilliant orange. After eating my fill of fresh fruit, I could think of no better use for this marvelous fruit than a frozen variation on lassi. 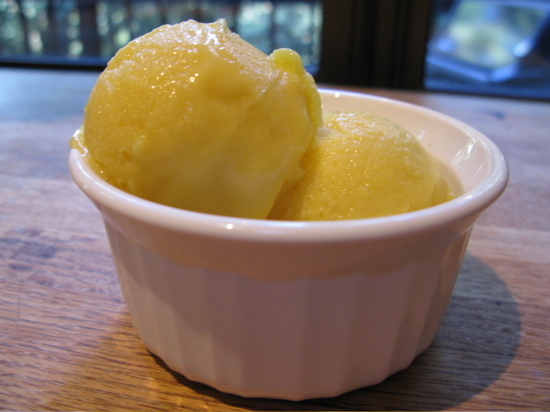 It’s simple to make with an inexpensive home ice cream machine. (Mine is a Cuisinart with a work bowl I stash in the freezer between uses.) Just whirl the few ingredients in a blender, chill the mixture, and freeze. Although whole fat yogurt would be better, the ubiquitous low-fat variety does fine. Just be sure it is not flavored or sweetened. Place all ingredients in a food processor or blender and whirl until well blended. Chill in the refrigerator for at least an hour. Freeze according to the instructions for your ice cream maker. Wow, I just logged on to your websit. It is really great. My mouth is watering right now as I read this. I look forward to a lot more from where this came from. What a GREAT new site! I’ll be passing this on to all my friends who love to cook and to eat…and who doesn’t! There is something so special about a nice ripe mango. Thanks for writing about them. Yum! Mango is my favorite, I’m totally making this, even if the weather is getting cooler. I’m glad I still get to read you! Will definitely be trying this. Both hubby and the munchkin loooove to order a mango lassi whenever we go out for Indian food. Julie: I wish I could still read you! Your departure from the Merc was a real loss for all your fans. I think you’ll like this recipe and it couldn’t be more simple. I finally got to your website. I have this wonderful black bean, mango, tomatoes and red onion recipe (all these ingredients just play off each other) and I hesitate to make it because I end up with slush instead of mango. You’ve solved my mango problem! Well researched site – love the kitchen gadgets! – Will look to incorporate some of your ideas into my site. Thanks!